Not only does it have a ton of tiny little 1 1/2 inch squares, the hexagon in the middle, along with the triangles surrounding it, make it a very hard quilt to piece! 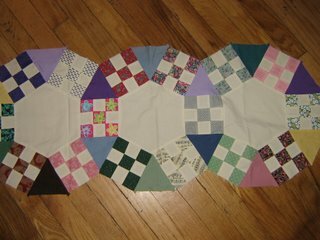 I thought I had a whole row finished, but when I got it out, I saw that I'm missing a nine-patch and two triangles on the very end. This is another project that I would love to have finished! Even though the pattern is difficult and time-consuming, it makes a beautiful quilt. When I have so much time that I don't know what to do with it...I'll finish this quilt! I think this one can become a table runner! Jack's Chain is so beautiful, it is on my to-do list. The ninepatches can be made pretty quickly, but I'm sure the hexagon shapes take a bit to do. So have you worked any more on it since your post? I recently started a Jack's Chain quilt. I am currently piecing all of the 9 patches. The setting in of the triangles is definitely challenging. I have never done that before so I practiced a bit before I started the quilt. It WILL be a ton of work but I think it will be worth it. Good luck with yours! hi, i'm a quilter in okc area. i just googled 'jacks chain' and your comments came up. i started my jack's chain a couple of years ago with off-white background, and each block a different color in the rainbow spectrum. it stayed on my design wall until around christmas 2006, when i decided what i did not like about it was the background. so now i'm making blocks each block a dark medium light of a color, with 3 9p and 2 tris and one hex in each block. after i get them all done, i will add in the extra tris and 9p that i need to make the rows. if you would like to see a progress pic of it, i have about 30 blocks up on the wall now. i can rearrange after i make as many blocks as i need, but for now, 1st row is red, second orange, then yellow, green, blue, purple and last is pink. you can email me at quilt4KSH@aol.com and i can show you pics if you are interested. I saw a ROBIN today!